A digital business model might be defined as a model that leverages on digital technology to improve several aspects of an organization. From how customers interact, to how the value proposition is derived, or how monetization happens. We all like to think of digital business models as innovative in their own sake. However, in many cases innovation happens by combining aspects from existing business models to create a unique formula. Almost like taking the same ingredients, remixing them by using different quantities and cooking time, an “innovative” business model is often the results of those recombinations. 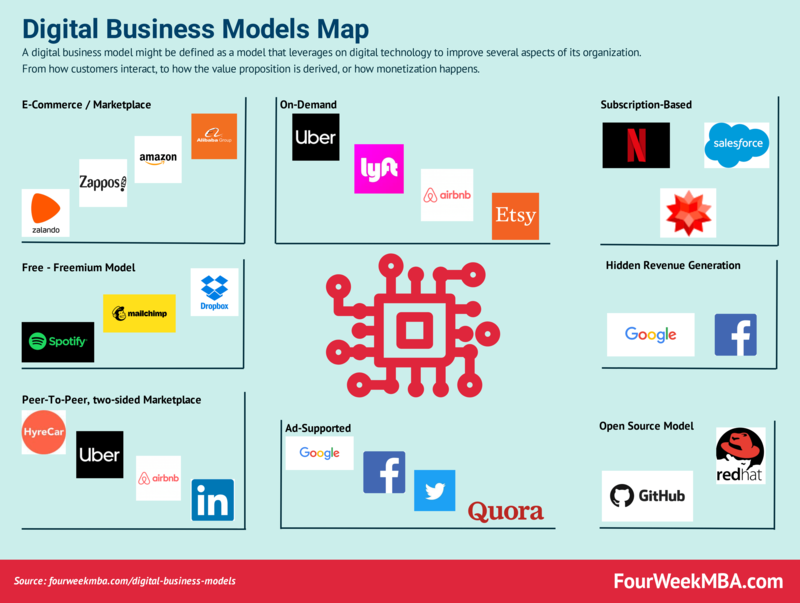 In this article, we’ll look at a few digital business models types that have become predominant on the web, and that can be used for your next digital business. An open source model makes software free to access, and it generally gives the ability to a community of programmers to contribute to it. Those two ingredients are essential. Free makes it spread very quickly. And the community side of it is what eventually determines its success. An open source isn’t a model on which companies can leverage to build a sustainable business model. Companies like Red Hat, for instance, make money by charging premium subscriptions and for training and services associated with its open source software. Indeed, in 2018, Red Hat generated over $2.9 billion in revenues, of which, $2.57 from subscriptions and $346 millions from training and services. Red Hat isn’t the only possible way to monetize an open source software. For instance, we covered already the Mozilla Business Model and how its for-profit side makes money through partnerships and distribution agreements with search engines. The 94% of Mozilla Corporation’s revenue comes from royalties earned through Firefox web browser search partnerships and distribution deals. According to StatCounter back in 2008 Mozilla Firefox controlled over 26% of the browser market. Today, due to the market dominance of Google Chrome and Safari, Mozilla has a 5% market share. Development. We employ an open source development model. The open source development model allows us to use the collective input, resources and knowledge of a global community of contributors who can collaborate to develop, maintain and enhance software because the human-readable source code for that software is publicly available and licenses permit modification. Licensing. We typically distribute our software offerings under open source licenses that permit access to the software’s human-readable source code. Subscriptions. We provide our software offerings primarily under annual or multi-year subscriptions as well as ondemand through our certified cloud and service providers (“CCSPs”). Building up an open source-based business model isn’t simple and it’s success highly depends on the ability of the project to engage the community of developers and contributors in working on the source code to improve it and make it very valuable. Also, such a model where a free service does allow strong marketing for the product. But it doesn’t necessarily translate in revenues for the company. For instance, Red Hut in 2018 employed $1.2 billion in sales and marketing expenses to distribute its paying subscriptions. The free model has become quite pervasive on the web. Starting from Netscape going on, companies have built great products, released them for free with the hope that once enough people would get used to them, monetization would not be an issue. While this model worked pretty well for products that scaled up quickly, amassed investments to sustain their infrastructure in the short term, and then found a monetization strategy. Companies like Google and Facebook have started in this way. They released a free service to a larger and larger user base. Attracted the first angel investors, then venture capitalists they had to then quickly turn to the advertising model to monetize their users, to avoid being left without cash and investors. Those are just some examples of how an open source model can be monetized. The freemium model has gained in popularity in the last decade. The reason is simple; this model allows a high virality growth. Cases like Dropbox, MailChimp, Spotify, and many others have created viral growth thanks to these models. At its core, a freemium model has a free version available to anyone, with no friction. Prompts within those free services to switch to paid subscriptions to get more volume, no advertising or more data. For instance, Spotify offers a free limited service, advertising-supported. But if users decide to get the premium service, they can listen to music without interruption from advertising and also download music to listen offline. Dropbox instead, makes you use more space with a premium service. And MailChimp gives you advanced features and the ability to handle more subscribers in your email list. We’re living in a subscription economy. The most entertaining and costumer-centered services we know today, from Netflix to Spotify and Amazon Prime follows a subscription model. In short, many companies are “subscribing” to this model as it allows them to build a sustainable revenue stream over time. However, it is essential to remark that creating this kind of model isn’t a simple task. Indeed, companies like Netflix and Spotify spend billions of dollars in producing original content that can make those subscribers wanting to renew their plan. Netflix is the subscription service that is changing the way we consume traditional media. From series like Stranger Things, Narcos and Black Mirror Netflix have been able to become a titan of the media industry, with more than a hundred and fifty thousand members across the globe. Usually, a model that relies on a subscription also requires essential investments in infrastructures, as what makes the services offered through this model is the ability of those platforms to know precisely what to watch or listen to next. Also, you’ll need to build a process skewed toward a great customer experience to minimize churn rates and improve the lifetime customer value. When your CAC or customer acquisition cost is higher than the lifetime value of your customers, your business will soon be bankrupt. The Web finally allowed people to consume content at their own pace and schedule. What mass media, like TV and Radio, didn’t accomplish, the Web did. An on-demand consumption allows people to have access to the content at different time intervals. This is true for content but also any other kind of service. Netflix had popularized this model when it made available at any time its shows through the platform. Yet other services, like Uber, and Lyft also built their success by leveraging on the on-demand model. As technological platforms allow people to interact instantaneously, it makes possible those kinds of services. Uber follows a business model become popular in the era of technological innovation. This is called two-sided marketplace, and it has a simple premise. You create a platform with great user experience, some elements of gamification, make it easy for two sides of a transaction to connect. This happens especially in industries where those two sides were prevented from transacting as the industry was dominated by a third party, which extracted most of the profits for that industry. When that third party is removed via the two-sided marketplace, the owner of the platform collects a fee from both sides of the transaction. The on-demand model can be monetized in several ways. From subscriptions to fees for each transaction on a platform. The critical ingredient is to create a smooth user experience, in which you barely realize there is someone in the backend manufacturing that experience. A peer-to-peer marketplace is a platform where usually two sides are participating in a transaction, which can be about products (Etsy) or services (Uber, Airbnb, LinkedIn). A peer-to-peer, or two-sided marketplace often fall into the chicken or the egg dilemma, where the marketplace to work needs both sides to interact. Yet the paradox is that to have demand on the platform you need a continuous generated supply. At the same time to have supply you need to create demand. Imagine the Uber case; the platform works as soon as there are enough drivers on the road to offer an on-demand and convenient service when riders need it. However, drivers want to drive at their convenience and when the fees are high enough to justify their effort. Therefore, the peer-to-peer marketplace usually faces several challenges in making sure the supply side is served adequately to justify demand. Uber, Airbnb, Etsy all face this issue. For instance, Uber uses several strategies to enhance the supply of drivers on its platform by using dynamic pricing strategies, like surge pricing. You can appreciate the importance of drivers supply for Uber by the fact that companies like HyreCar have built their whole value proposition based on the supply scarcity on Uber. HyreCar is a peer-to-peer marketplace where owners of cars can rent their idle vehicles to drivers that want to make an additional income via ride-sharing services like Uber, and Lyft. As a two-sided marketplace, HyreCar makes money by charging drivers for direct insurance and a 10% fee on the weekly rental expense. And by taking a 15% fee from owners weekly rental income. One of the first companies that proved the web wasn’t made just of connected computers but of people ready to purchase physical stuff on it was Amazon. Started as a book store the company soon branched out to sell music and related products. Until it became the everything store! Today an e-commerce business model is taken from granted and is among the most used digital business models. If Amazon had proved that the web could become an everything store, a company that changed the way media could be consumed was Google. Rather than just having to type a website address in a browser, people could search for anything they wanted. Google made all its services, and apps completely free. While on the other side it monetized the data captured via its search engine pages with an advertising network called AdWords (now Google Ads). When Google IPOed back in 2004, it showed to the business world how powerful its digital advertising business was. Indeed, in a matter of a few years, Google passed the billion dollars mark. In 2017 its advertising business passed the hundred and ten billion dollars mark! To make sure, while a digital advertising business might be easy to set up, it’s not an easy one to run and make profitable. Unless you’re Google or Facebook with their dominant advertising marketplaces, you won’t be probably able to make money via advertising alone unless you have a very large users’ base. Google primarily makes money via its advertising network that in 2017 generated 86% of its revenues. Then, the other side of the business – almost 13% of its revenues in 2017 – comprised money from the Apps, in-app purchases, and digital content in the Google Play store, Google Cloud offering and Hardware products. The remaining part is attributable to Google “other bets” a set of risky businesses Google is betting on. Hidden revenue generation is about making money while the people that most use your service barely realize that. A great example is Facebook (and Google). If you ask an average Facebook or Google user, she won’t know how the company monetizes. That’s because those companies have invested massive resources in creating this kind of experience. Each model we saw above isn’t a blueprint that can be applied entirely to a company. Often business models are the fruit of the combination of several models. For instance, Airbnb and Uber are on-demand, peer-to-peer marketplaces. Many businesses we analyzed throughout the article uses several models to build a successful business model. For instance, Google leverages on an open source model for some of its products, while it monetizes its core product (the search engine) with a hidden revenue model and it also leverages on making its products free to large masses to gain traction quickly and make of its products a standard! Previous Previous post: What Is A Negative Externality In The Digital World? Next Next post: What Is The Difference Between A Business Model And A Business Strategy? What Is A Negative Externality In The Digital World?